Double bin for home appliances.It has two pedal to control different lid, made of stainless steel. Because stainless steel is resistant to air, steam, water and Other weak corrosive media and acid, alkali, salt and other chemical erosion medium corrosion, so stainless steel trash canopy high durability. Body stainless steel trash also has a fire function, durable. * This model has capacity up to 10L+10L volume with inside detachable container for easy cleaning. * Body: Fingerprint-proof frosting sheet(410 stainless steel)-0.35mm,barrel:PP plastic,Cover:ABS. Looking for ideal Dual Garbage Can Manufacturer & supplier ? We have a wide selection at great prices to help you get creative. All the Double Trash Can are quality guaranteed. 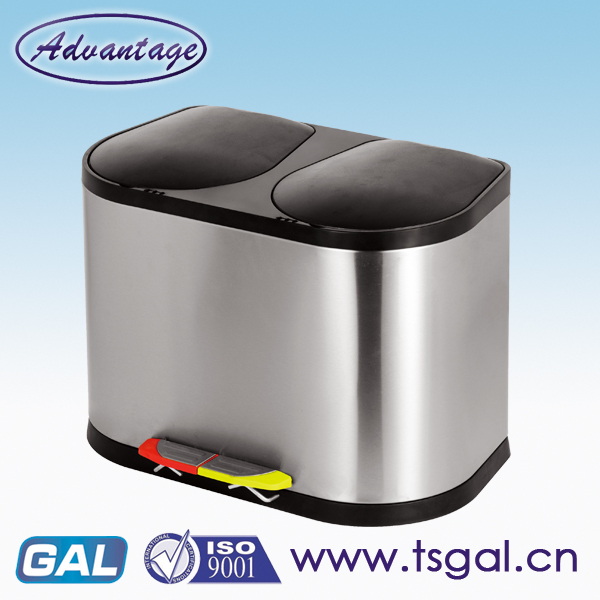 We are China Origin Factory of Stainless Steel Step Trash Can. If you have any question, please feel free to contact us.